BENGALURU: People who were responsible for the successful Steel Flyover Beda campaign two years ago have now thrown their weight behind a campaign to do away with an amendment in the Karnataka Preservation of Tree (KPT) Act, 1976 that would make it easier to cut down certain species of trees. The campaign this time has quickly gone viral and some say that it might be even bigger than the Steel Flyover Beda campaign in terms of citizen participation. A number of activities as part of the campaign have already been launched. Priya Chetty Rajgopal, a founder of the citizens group, Heritage Beku and one of the leading figures in the Steel Flyover Beda Campaign, says, "We launched an online petition a week back and it already has around 15,000 signatures," she says. The petition has been named the #KillBill Stop GoK KTPA Amendment to destroy #trees. "When we talk about heritage it comprises of many things including natural and cultural heritage. Trees and lakes are also a part of our heritage as a result the Beku Team has taken this campaign under its belt,"she adds. Priya says that a number of well-known personalities from the city such as Ramachandra Guha, Girish Karnad and former Lokayukta Santosh Hegde have come forward to support of the campaign. An initiative called #greyforgreen as part of the campaign was also started where people have been asked to hug a tree, take a black and white picture and then post it on social media as support. Deepti Sudhindra, another founding member of Heritage Beku says, "We got the inspiration for this initiative from the Chipko movement. What this movement fought for and what we are fighting for now is essentially the same thing. The campaign is viral all over social media and we have been flooded with responses on the internet," she adds. Even freedom fighter Doreswamy has taken part #greyforgreen initiative. As part of another initiative under the campaign, members of Heritage Beku along with concerned citizens have been attending the ongoing proceedings of the state legislative assembly. "There are around 10 to 15 people wearing green and have been going to the assembly observe the proceedings as a means of protest," says Priya Chetty When asked about parallels with the Steel Flyover Beda campaign, Priya says, "At the time of the Steel Flyover campaign, we did not know what to do. It started with an FB post and it just grew from there. I can definitely say that in the five days since we launched the campaign against the KTP Act amendment is comparable to the work done in one month during Steel Flyover Beda campaign," she adds. In addition to the petition of Heritage Beku, another online petition was launched by Jhatkaa.org, a campaigns and petition platform that has also joined hands with Heritage Beku to oppose the amendment of the KPT Act. The platform also launched an initiative whereby citizens who want to support the campaign merely give a missed call on a number specified by the org to show their support. Divya Narayanan, campaigns manager, Jhatkaa.org says that support for the miscall and online signature campaign combined together has crossed 45,000, according to latest figures. Many other concerned citizens have also launched their own efforts to oppose the act. Vijay Nishanth, conservationist also known as the tree doctor has written to Congress leader, Rahul Gandhi on the matter. "Its a very wrong move to amend the KTP Act like this. There is no scientific backing to it and people pushing for it have no clue what it entails. The KTP Act about conserving trees but people in authority are making it legal to cut trees," says Vijay. 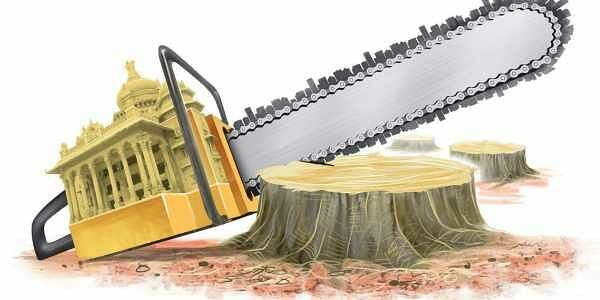 Other organizations that are against the amendment are the Namma Bengaluru Foundation, Eco Watch.